Uncertainty is the most stressful feeling. With the release of the Grymkin faction Privateer Press also brought in a brand new mechanic, Arcana. I've previously written about the basic workings of Arcana, and reviewed 5 of them. Today I'm writing about the other 5 general Arcana; Desolation, Labyrinth, Pandemonium, Shroud, and Sacrifice. I know I said it in my last post, but it's worth saying again. The biggest mistake I see or hear about with Arcana is "I always take the same ones". A large appeal and one of the most incredible things Grymkin has going for it is their flexibility. Arcana are a large part of this. Don't squander this by being lazy with your Arcana selection. Trigger: The Warlock can play this card when an enemy model advances into and ends its Normal Movement in the Warlock's control range. Benefit: Center a 4" AOE on the enemy model. You chose whether the AOE is acid bath, burning earth, forest, hill, rubble, or shallow water terrain. You can chose to remove the AOE from the table at the start of any of your turns. This is one of the harder Arcana to quantify. People always want to put things in simple terms. This 7 point unit killed 8 points worth of dudes, they're amazing! There can be subtlety and board control with this arcana. Or there can literally be fire and acid. Dropping an acid bath on advancing shield wall troops can be incredibly satisfying. However using this to further funnel an army that struggles with rough terrain can be an easy avenue to a scenario win. Blocking LOS with a forest can often save our front line some charges they were otherwise going to have to eat. In some cases we can even drop rubble or hills to provide a def bonus vs shooting for our own models. 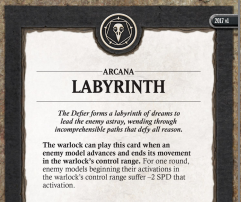 The only synergy I want to mention here is Artifice of Deviation on the Dreamer. That spell allows us to drop a 5 inch AOE of rough terrain, with this arcana thats a lot of rough terrain we can put down. I tend to consider taking Desolation if the table is already terrain heavy, and the opponents army doesn't have a ton of pathfinder. I also consider it against large infantry swarms, tough armies and higher arm single box models. When playing into Desolation be sure to be mindful when moving your models. If you've already advanced most of your shield wall troops, don't give them an AOE where it'd hit the entire unit. Remember that Desolation can be used to block LOS. Prioritize your turn, take your important charges or attacks first. Try to lessen the impact this arcana has with smart order of activations. Trigger: The Warlock can play this card when an enemy model advances into and ends its movement in the Warlock's control range. Benefit: For one round enemy models starting their activations in the Warlock's control area suffer -2 speed that activation. There are games when this will be back breaking. Obviously it's stronger on our casters than can play more forward, and have a larger control ranges. Against slower armies like Khador jack Spam, or Minions Will Work for Food we can use this to help dictate engagement, or leverage scenario. We can also use this with any of our "enemy movement abilities"(Witchwood, Hollowmen UA, the dreamer etc etc). By backing up their unit leader on our turn, and then limiting the distance they can move forward we're controlling the entire unit's ability to advance. I've also played plenty of games where this was clearly the wrong choice. Speedy infantry and gun lines obviously aren't impacted as heavily by this. Models with a secondary movement ie sidestep, overtake, leap etc etc also can mitigate this Arcana. The last thing I'll mention is to get the "most value" out of this we want to pop it early. I often like to keep my Arcana triggers open so I can adjust to any unexpected trickery, this definitely limits that. When playing into Labyrinth be sure to "forfeit movement" on models who don't need to move. Like Desolation smart order of activations can limit this arcana's impact on your force. Remember it's available and plan your turns according. Ensure you don't over commit and leave models strung out with little support, or against models you thought would die only to discover they are now out of charge range. Trigger: The Warlock can play this card when an enemy non-warcaster, non-warlock model issues an order while in the warlock's control range. Benefit: The model's unit is not affected by the order. Warlock and warcaster units are not affected by Pandemonium. Stopping orders! I'm having Rengrave mk1 flashbacks. The obvious use is to stop charges, which is great. But sometimes preventing a shield wall, or a run (scenario) can be more devastating. Remember the model issuing the order has to be in the control, not just someone in the unit. Pandemonium is best into elite shield guard bricks. Think Centrati, PiggyBacks, Man O'Wars or any army thats going to use a shield guard brick to wheel around. Any time heavy hitting expensive infantry units are on the table I consider this as well. Be careful when selecting this to use vs cavalry models, as they often start their charge outside of our control ranges. When playing into Pandemonium be conscious of where you unit leaders are. If possible vengeance, or apparition back out of the Grymkin players control to be able to issue that order you need. If/when this Arcana is used against you be sure to take the units normal activations. They still can advance normally, and make attacks. Trigger: The Warlock can play this card when a friendly Faction model is destroyed by an enemy ranged attack while in the warlock's command range. Benefit: For one round, friendly Faction models gain Stealth while in the warlock's control range. Okay first this is one of the Arcana that triggers in command, not control. Our defilers command ranges vary wildly, from 1-10. So be sure to keep that in mind when thinking of selecting this Arcana. Also consider what models are going to be shot, and die in your list. I see so many (and run some myself) lists in Dark Menagerie that don't have the infantry or fodder to effectively trigger this. Last thing worth mentioning is things like flare make you lose stealth. However if your pop Shroud after you can regain the benefit of stealth. Things like Noisy, continually drop stealth, so popping shroud wouldn't help here. Last tip is "priming" a crabbit. I'll often punch my own crabbit on turn 1 and try to soften them up. This is to maximize the odds of being able to trigger a Shroud off a shield guard. Obviously I'm taking this vs gun lines. A lot of people consider this an auto include into the ghost fleet matchup. What do you guys think about this? I feel like a broken record, when playing into Shroud be sure to properly prioritize your order of attacks. Take the ranged attacks you 100% need first. Consider the ones where the odds of you killing a model with it are lower. Remember the model you kill has to be in his casters command range, but the benefit is to all models in his control. Trigger: The Warlock can play this card when an enemy model destroys a friendly Faction model in the warlock's control range. 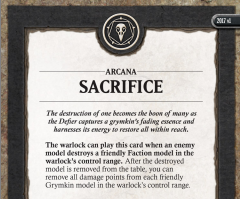 Benefit: After the destroyed model is removed from the table, you can remove all damage points from each friendly Grymkin model in the warlock's control range. Clearly this has a chance to be a home run arcana. Healing every model in the warlock's control range can be monstrous. I've run infantry into beasts I think will frenzy (look at the board, count the fury, and figure out what their priorities will be) to trigger it early in the opponent's turn. Offer your opponent free strikes during your turn they can't refuse. It's shockingly easy to trigger this, and if your opponent is spreading damage around it can be a game changer! I've taken this in Bump with piggybacks or Dark Menagerie with beast spam. I think it's important to consider the opponents list when thinking of selecting this. Is he going to grind me down? Are there going to be lots of units making attacks (attacks tend to be more spread out) or more jack/beast based. Don't automatically include this just because you have a lot of boxes. Think about how your opponent is going to grind through those boxes. When playing into Sacrifice, be sure to FOCUS FIRE. Burn down one model then move to the next. Don't count on AOE's or nickle and diming things down. Remember grevious wounds, and anything else that prevents removing damage. So there we have it, 5 more Arcana covered with some basic tips for using, selecting, and playing against them. I hope this helps you in your games and would love to hear anything you disagree with! Stay tuned for part 3 where we cover the rest of the Trumps. What are some of your favorite Arcanas? Am i missing any 'hot tech'?